The correct size, length, and gauge of wood screws can be difficult to determine when building woodworking projects. Adding other factors such as the type of wood, screw material, lateral vs. sheer forces, and the presence of pilot holes only complicates the issue. Fortunately, there are some general guidelines you can follow that will help you purchase and use the correct type of wood screw for the job. All sizes, except for gauges, are in inches. Head-bore size refers to the diameter of the screw head. Shank-hole size refers to the diameter of the smooth part of the screw above the threads. 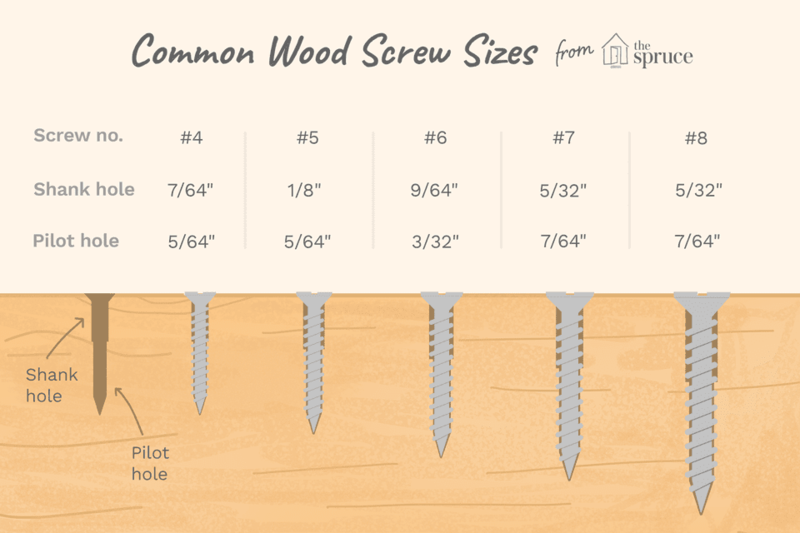 Understanding a few basic principles behind the technology of wood screws will take you a long way toward knowing which type of screw to choose. Length: Wood screws must be long enough to hold the two boards together securely. If the screws are too short, they may not adequately hold the boards together. If they are too long, they will piece through to the other side. Thickness (Gauge): Wood screws must be thick enough to grab onto the two boards. If the screw is too thin, it may pull out of the wood. If the screw is too thick, it may split the wood, rendering it useless. Pilot Holes: Drilling a pilot hole in hardwoods with a regular bit or with a countersink bit before driving the screw is usually a good idea. Hardwoods such as oak or walnut are inclined to splitting, but softwoods such as pine or cedar are less prone to splitting. Wood screws gain power by friction and by the pressure of wood fibers gripping the threads. When you cut away fibers and remove them, a pilot hole can reduce the grip of the wood around the screw threads, thereby lessening the holding power of the screw. Wood screws need to have enough thread driven into the receiving stock to hold fast. The length of the thread that is inserted into the receiving board is dependent on the forces, either lateral or withdrawal, that will be applied to the boards after they are in use. Lateral Loads: If the forces will apply lateral pressure, also known as sheer pressure, consider using a thicker screw than you might otherwise choose. This is the type of pressure where two boards attached flat to each other are subjected to a sliding motion. Kitchen wall cabinets screwed to wall studs is one example of lateral or sheer pressure. Withdrawal Loads: If the forces will apply pressure that wants to pull the boards straight apart, called withdrawal pressure, be sure that ample screw threads are inserted into the receiving board. Always to try to get at least 1 to 1 1/2 inches of thread into the receiving board. This assumes, of course, that this length of the screw will not poke through the opposite side of the board. In the event that you need shorter screws to prevent this problem, you'll need to compensate by driving more screws. Screws designed for fastening wood come in two basic forms: steel or stainless steel wood screws, or utility screws (often generically known as deck screws). Utility screws are the workhorses of framing carpentry and outdoor woodworking projects. They are available in different types of steel, sometimes corrosion-resistant metals designed to stand up to the chemicals in treated lumber; and they are normally sold by length. Steel or stainless steel wood screws have thicker bodies and are typically used for precision woodworking and indoor furniture. When you buy wood screws, they are identified both by their length and also by their gauge, which refers to the thickness of the screw shaft. Larger gauge numbers indicate screws with thicker shafts. While utility screws are typically #8 or #10 gauge, steel wood screws are available in a much wider selection of gauge diameters. The number and length of screws that are used will depend on the grain orientation of the receiving board. As a general rule, screws needed for attaching two boards across the grain do not need to be as long as when screws are inserted into end grain. When screwing into the end grain, aim for at least two inches of thread in the board. As a general guideline, you can use #8 diameter deck-type screws for most utility tasks. Use 1-1/4 inch screws for basic tasks where strength is less of an issue or when attaching two 3/4-inch-thick boards across the grain. Keep some 2 1/2-inch deck screws for screwing into end grain, plus some stronger 3-inch screws for attaching into end-grained boards, or when a little extra added power is needed. Finally, if there will be a lot of sheer strength needed, you can opt for some 1/4-inch diameter lag screws. No matter whether inserting screws into end grain or cross-grained boards, many experts and skilled do-it-yourselfers always opt to drill pilot holes with a special countersink pilot bit. This type of bit drills a small-diameter hole the length of the screw shaft, with a wider counter-sink portion that will allow the head to be sunk flush with the surface of the wood.